"I've just come home this evening to my ring, and it's absolutely lovely! We are a bit stunned, really -- I mean, we've designed it with you both and have seen the photos that you so kindly sent, but it's really another beautiful thing altogether "in person"! I absolutely can't wait to make our announcement and then wear it. Thank you again for everything -- you've been so helpful!" 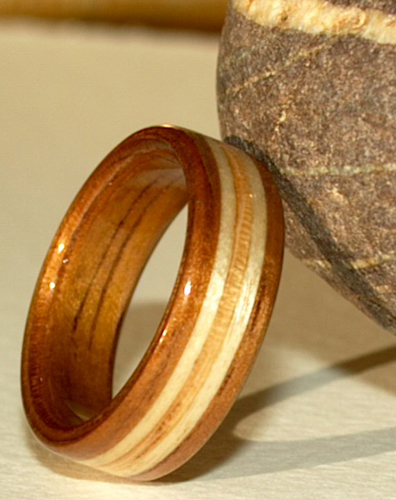 Darker Hawaiian Koa Wood Wedding Rings with birch wood interior liners. 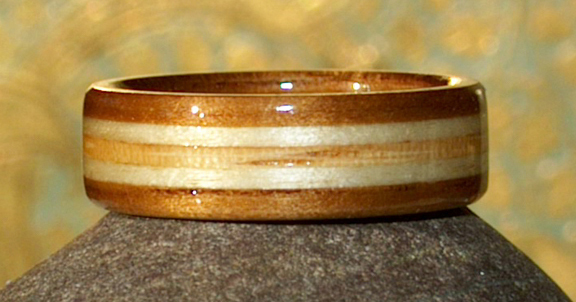 Designed by a couple in Whitehorse and incorporating beach sand as their inlays.